Simplicity and sparkle, what's not to love?! So pretty. Love that setting - the beautiful warm golden glow of the timber and the pretty soft peachy/apricot flower arrangements ~ just perfect!! Love the candles in the mason jars. Lovely! I'll bet it was a great party. Kellie, I passed the Stylish Blogger Award to you. You can copy the badge from my blog for yours if you wish! You are very stylish! I want this to be my wedding (even though I am both single and only 22). A girl can dream! 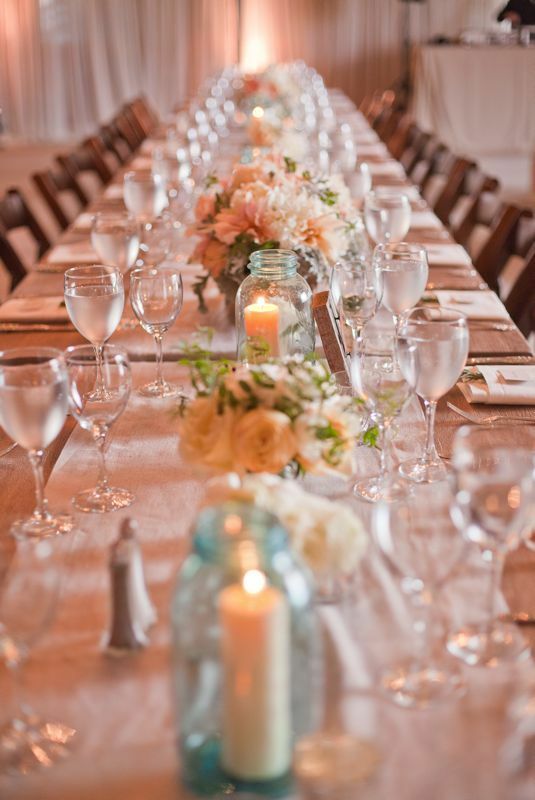 This is a dream party setting for me - this is my kind of rustic chic!! Lovely! 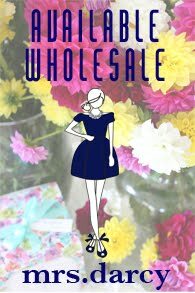 And congratulations on your feature in Adore! I absolutely adore this look. 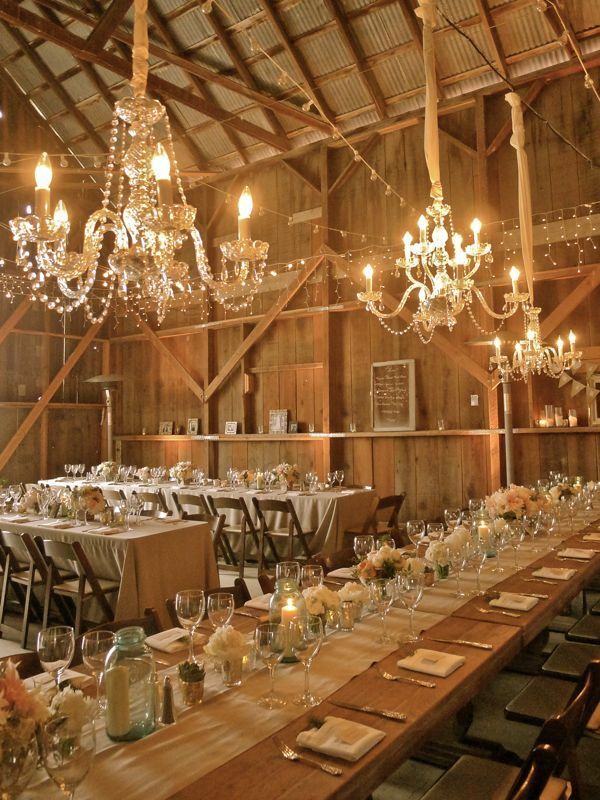 Every time I see a barn style wedding like this it makes me wish I lived on property and had my own big ol' barn! Alas, I'd have to move out of Sydney to get that! i think that would be a great place for an elegant ho-down. Oh my gosh! How divine? Absolutely beautiful. Ahhh, Kellie, this is SO Texas!! So beautiful! I work for a Southern wedding publication and we have a few clients with barns and they often have swanky events! Love to mix the rustic with chic elegance!! Looks like it's in a barn. What a great place to have party! Wish you a beautiful Monday, Kellie! 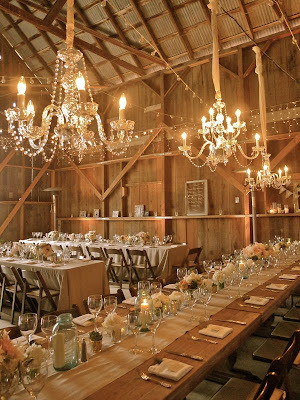 Oh yes, that mix of rustic old shed with the chandeliers and candlelight. It looks lovely. You're right, it's the mix of rustique and refinement that make this so inviting. I love it now we have to see what the guests were wearing! I hope the woman wore silky "robes de soirée" and the men were wearing their tux!! Perfect. Lovely,dreamy day to you! xxIris. The barn is gorgeous. What a beautiful wedding reception! It's lovely and warm, with a rustic romantic feel to it. Loving it! Love the juxtaposition of elegance and rustic. Agreed! I saw this wedding last week and thought the same thing! It's so simple, yet so stunning! Inspiring images! i want to dine there. I am drooling. This is definatly going to be added to my dream wedding scrapbook which has been in the works since I was twelve(my boyfriend shrills with horror when he sees me working on it)You must do more wedding posts, you have such great taste. Kellie- Wonderful conversations would go on there, with just the right amount of gossip! what a gorgeous event indeed! it is positively gorgeous. Beautiful!So rustic and stylish at the same time. Oh my!! No words.... beyond perfection. love it love it looooveeee it!! !